How many continents and oceans are there in the world? Play this quiz and find out now! Which is the largest continent on earth? Which ocean takes up about half of the surface of the earth? Which ocean borders the United States on the east coast? Check off the bodies of water that surround this continent. In which hemisphere is the Indian Ocean? How meny continents are there in the world? 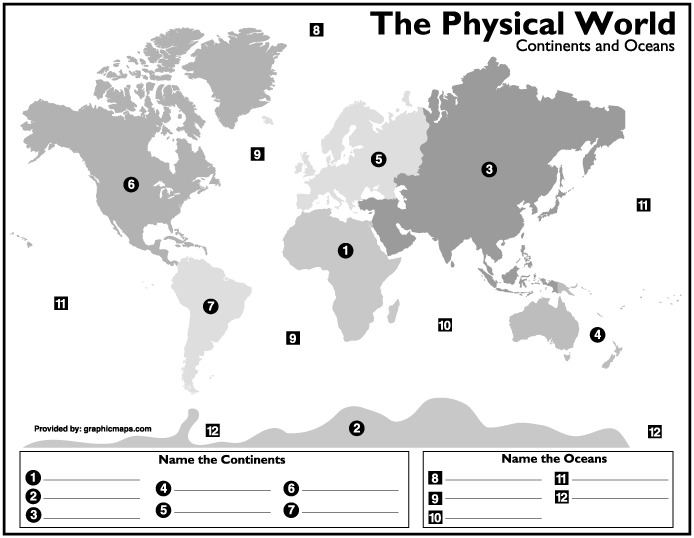 A good thing to help with oceans and continents for schoool.Aspeshaly for a school test. Do you know how many continents and oceans are there in the world? Play this quiz and find out now! Take this quiz and identify the name of continents and oceans. Let's start this quiz now! To take this quiz use the map, and what you know about each continent to answer the questions. What two continents are green?